The Volunteer State Community College Speech and Debate Team won the Novice National Parliamentary Debate Tournament recently at Bowling Green State University in Bowling Green, Ohio. The team won other awards in several events. The Vol State team competed against over 200 other Novice students. The Novice Nationals event is designed to be an educational, yet competitive, atmosphere, and is open to students in their first year of intercollegiate forensics competition. Nine teams and five schools competed in Debate while sixteen schools competed in the Individual Events competition. Elijah Avery, sophomore from Lebanon, and Danielle Salvato, freshman from Hendersonville, won first place in Novice Parliamentary Debate. Additionally, Avery won 2nd place Debate, 2nd place in Impromptu Sales, 3rd place in Impromptu Speaking, and 3rd place Pentathlon. Autumn Howard, freshman from Hendersonville, won sixth place in Persuasive Speaking. "Upon joining the Vol State Speech and Debate team last semester, I never thought that winning a national tournament would be in my future,” said Avery. 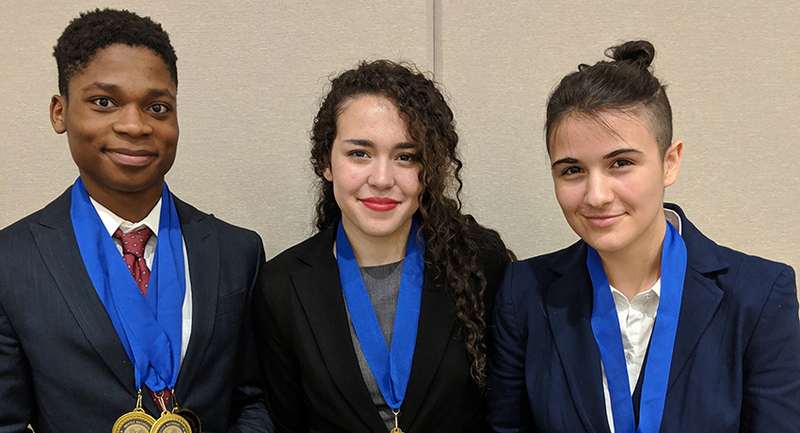 “I'm incredibly ecstatic for not only earning a national title, but being able to do so with talented and passionate teammates and a fantastic coach whom without this would not have been possible to achieve"
The Vol State Speech and Debate Team is comprised of students from different academic divisions. Students can apply in the fall semester to be part of competitions next year. For more information about Communication programs at Vol State visit www.volstate.edu/communication. Pictured: The Vol State competitors, left to right: Elijah Avery, Autumn Howard, and Danielle Salvato.